As episode two opened, Brie Bella and her husband, Daniel Bryan were still busy preparing for the arrival of their first child. During last week’s episode, the couple was engaged in friendly debate over certain aspects of Brie’s handling of her pregnancy, however, it appeared that the debates were far from over. This week, Brie and Daniel engaged in the great diaper debate, namely whether to use cloth or disposable diapers for their baby. Brie thought that the easier option would be to simply use disposable diapers, while Daniel preferred the more environmentally-friendly cloth diapers. In order to persuade Brie that his way of thinking was best, Daniel decided to take Brie on a tour of the landfill in order to show her how long it takes dirty diapers to decompose. I for one wonder whether it wasn’t a serious health risk to take a pregnant woman to the landfill, but I’m sure Daniel did his research. In fact, it seems Daniel has been doing a lot of research concerning his wife’s pregnancy, and imparting his knowledge to his wife. While I applaud Daniel for wanting to be involved in his daughter’s life even in the womb, I could see why Brie might be annoyed with the constant stream of facts that her husband has been dishing out. However, I think that what she chose to do in response to the constant flow of research was just a tad mean. While at lunch with her mother and sister, Brie did some research of her own. She discovered that by placing electrodes on a man’s stomach, and giving him mild electric shock one can simulate to some degree the pain of labor. Brie and Nikki were certain that Bryan would adamantly refuse to undergo the false labor experiment, but Bryan was actually excited about it. Perhaps, he felt that it would be nice to add practical experience to his research, or maybe he just likes trying new things. Whatever his reasons, Brie and Nikki were all too happy to schedule the experiment in John and Nikki’s Phoenix rental villa. They also chose to invite the entire family to support or make fun of Bryan. The sisters also convinced their brother, JJ, to try the experiment as well because his wife so recently delivered their daughter. JJ was the first to try the experiment, and didn’t like it at all. At the equivalent of 1 cm of dilation JJ was in pain and wanted to stop the experiment. By contrast, when it was Brian’s turn, he remained calm throughout and didn’t scream or cry out once. I guess this should show Brie that her husband is a lot tougher than he thought, and also that his researching comes from a place of love, and not judgment. Meanwhile, JJ and his wife continued to struggle with their marital problems, and Nikki struggled with keeping his secret from the rest of the family. Using her maternal instinct, the mother of the Bella clan seemed to deduce that all was not right with one of her children. Hoping to get information from Nikki, her mother began to make speculation about relations between her and John Cena knowing that they were false, but hoping that Nikki would tell her the truth in order to deflect attention from her own relationship. Eventually, Nikki did admit the truth to her mother, and these three Bella women began to attempt to solve JJ’s marital problems for him by accosting him and demanding that he and his wife attend therapy. 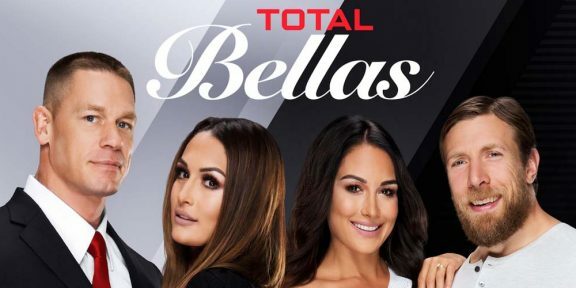 It seems that the Bella women will never learn to mind their own business, however, if they did this season of Total Bellas would be much less exciting. So, here’s hoping that there’s plenty more meddling to come.